If the tone of Donald Trump’s response to Fidel Castro’s death this weekend foreshadows his foreign policy approached to Cuba, America should be concerned. The president-elect seems to be letting bitter feelings from Cuba’s exile community get in the way of fomenting sound Cuba policy that will not only be good for both nations economically, but finally thaw the anxieties of its Cold War past. His tersely-written statement condemning Castro’s legacy “of firing squads, theft, unimaginable suffering, poverty and the denial of fundamental human rights” won’t get us to there. During the campaign, it made sense for Trump to appeal to the crowd of 25,000 with such hardline rhetoric. Cuban Americans, particularly those who make up its exile community, comprise a potent voting bloc that can shift electoral politics in the state; roughly 50 percent of them backed Trump on Election Day, according to a Pew exit poll. But isolating Raul Castro’s government over human rights isn’t really a foreign policy approach the United States has ever hewn to.. In fact, America regularly conducts business with nations that have horrible human rights records, including Saudi Arabia, Turkey, Kazakhstan and Equatorial Guinea. The bigger issue with isolating Cuba is that it leaves the 54-year-old missile crisis hanging above our heads when both nations need to move on. Cuba is clearly no longer the military threat it once was. 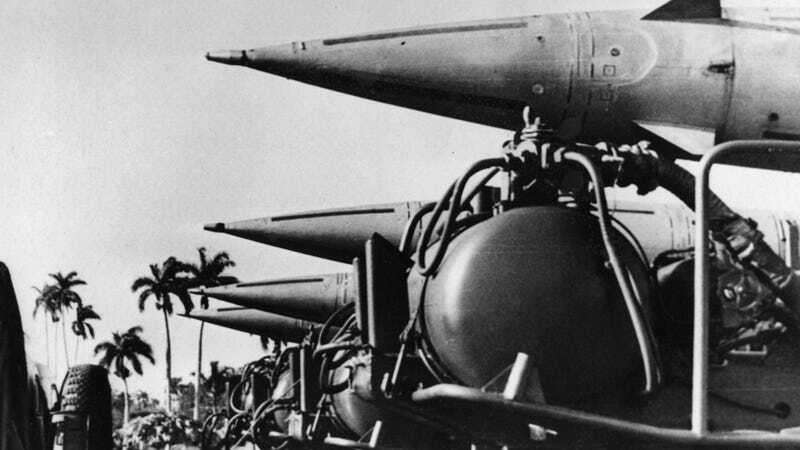 The missile crisis is a dark cloud that no longer carries any real risks of making a reprise. The 40,000-plus Soviet troops that were once stationed in Cuba have long left. The ballistic missiles that were aimed at America are gone. The Soviet Union, Cuba’s top ally, collapsed in 1991. Lifting it would show Havana that America is ready to fully welcome it into its sphere influence and that any mention of missile crisis is reserved for the history books. Also, lifting the embargo would signal that Cuba is off limits for other would-be suitors. Like Russian President Vladimir Putin, for example. Putin is probing the world for allies to serve as a counterbalance to what he feels is American imperialism. His strengthening of ties between Moscow and Beijing have resulted in a formidable alliance at the UN Security Council where the two nations often veto in tandem against U.S. interests. In a very shrewd move, Putin worked with Obama ensure the Iran Deal greenlighted economically-isolated Tehran to reintroduce millions of barrels of oil to the global market. As for Cuba, Putin wrote off more than 90 percent in Soviet-era debt the island owes Moscow, which totals $35 billion. He has even brought up the possibility of reopening a Soviet-era military on the island. That may be a long shot because Raul Castro likely would not want to risk losing future American business investments or any hopes of lifting the embargo by allowing Russian troops to set up shop 90 miles away from Florida. But that doesn’t mean it can’t happen.. NATO has been operating on Russia’s doorstep for decades. Why wouldn’t Putin at least try? Trump and the right-wingers that already make up his national security team seem more devoted to ideology than sound geopolitical policy. Demonizing a dead Castro will not help assure the Cuban government that America is not its enemy. Trump and his administration need to leave the anti-Castro rhetoric behind and, accept the fact that isolating Cuba could leave it susceptible to other nations’ influence. I bring up Russia often because we tend to underestimate how bold Putin is at the moment. He regularly threatens Baltic airspace, his troops annexed Crimea and have set up camp in much of eastern Ukraine, and his military forces have deployed lethal Iskandar missile systems in its Kaliningrad region. This doesn’t include Moscow’s submarines and spy ships operating dangerously close to submarine fiber-optic cables. The fear is that Russian ships could cut those cables, disrupting U.S. communications and financial flows worldwide. What, then, would prevent Putin from at least exploring the possibility of trying to compete with Washington over Cuba, given his newfound confidence? Cuba has every reason to fear a Trump presidency. After Obama has spent years trying to reconcile the historical grievances between Havana and Washington, America has elected a man who has used every opportunity to gin up old Cold War anxieties among older Americans and Cuban exiles. That is not being tough against a dictator; that’s just plain shortsighted and only emboldens Havana to convey to its people that America wants Cuba to remain weak. And if Trump continues with this tone after Inauguration Day, Havana may feel more secure courting suitors because America is playing by a human rights double standard. If Trump is as strong and tough as he claims to be, he’ll muscle Congress into lifting the embargo and allow free economic commerce between the two nations to flourish. The Cuban people, over time, will ultimately make their own decisions on the course of their nation with newfound economic investment. That is the boldest call for human rights Trump can ever make.